(First published, in slightly different form, in The Dancing Times, London, February 2006). The reader is asked to respect the Copyright of those photographers who have generously donated their work to this report. No illustrations appear of the joint CNR/CNSM class and performance, as French law forbids the publishing of minors’ photographs. 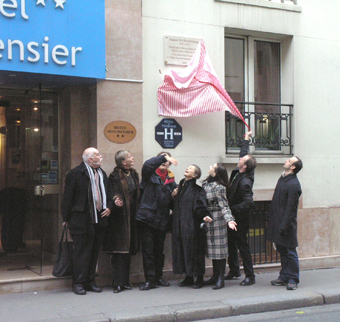 On December 5th and 6th 2005, the City of Paris was host to a celebration to mark the bicentenial of August Bournonville’s birth. 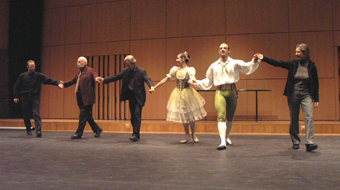 The Danes came down in force, a six-man team comprised of Frank Andersen, Artistic Director, Royal Ballet, Anne-Marie Vessel Schlueter, Head of the School, Flemming Ryberg, Professor, Character Artist, Erik Aschengreen, Professor of Art History, and principal dancers Diana Cuni and Thomas Lund. Thanks to the enthusiasm of Anne-Marie Sandrini, Inspector of Dance for Paris, to the art historian Richard Flahaut, and to the efforts of Nathalie Moreno at the Conservatoire National de Région (CNR), events turned out beyond all expectation - indeed, 250 persons, some sitting in the aisles, others standing round the sides, awaited the team at 9.30 on the Monday morning in the Conservatoire National de Région Auditorium. 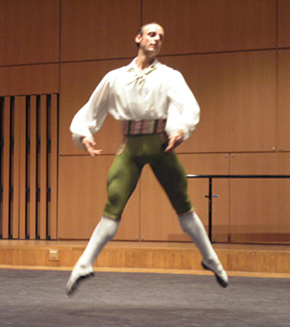 Meanwhile, David Leonard, editor of Dance Books, and distributor of the "Bournonville Schools" package, kindly rushed through the printing of several hundred leaflets on the Schools just in time for the Conference -all of which vanished into the crowd in the twinkling of an eye. The public was made up of students and professors from the Paris Municipal Conservatoires, the CNR, the CNSM, private schools, the Paris Opera, balletomanes and, importantly, a number of musicians. 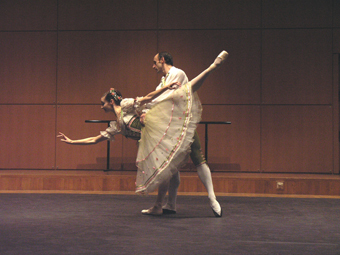 All classes were cancelled for that day in the CNR and the Conservatoires, in order to enable the students and professors to attend, so the room was full of young dance students. Diana Cuni & Thomas Lund in "Flower Festival"
Our kind host at the CNR was the musician Xavier Delette, Director of the CNR. Introductory remarks were given by Erik Aschengreen and Anne-Marie Vessel, who outlined Bournonville’s life, and why Frank Andersen had decided against all odds to push through the Bournonville Schools film project in 2003/2004/2005. 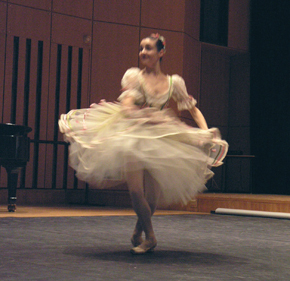 Anne-Marie Vessel then explained, using extracts from the films, the characteristics of the Bournonville School. This was followed by a class on stage for any professor who cared to join - it takes guts to stand up and dance in front of your own students, and other reputed professors! But thirty to forty did put on their shoes, and danced, with a very good grace. 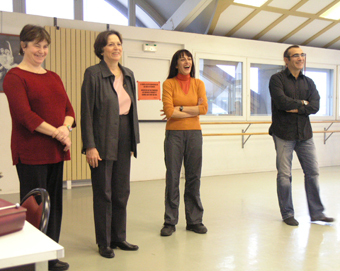 The scene then removed to the Théâtre des Abbesses for a joint CNSM/CNR class taught by Mie Vessel and Flemming Ryberg to the students of Jocelyn Bosser and Carole Lagache. Back to a packed CNR auditorium at 16.30, where the students of Carole Lagache presented, with considerable feeling, extracts from Le Conservatoire, which were then corrected by the Danes, and danced again. The day ended with the Flower Festival, danced by Diana Cuni and Thomas Lund, who unleashed what would be fair to describe as wild enthusiasm. Discussion went on for over an hour in the halls outside. One teacher was heard to say "It makes me want to move to Denmark". Another : "this is la vraie grande danse the way we have forgotten to dance". Another: "the simplicity and truth of these people, explains the strength and truth of their dancing". The following day, a studio in the name of Auguste Bournonville was inaugurated in the Conservatoire du VIIème, by the musician Edith Canat de Chizy, the first woman to be admitted as composer to the Académie des Beaux Arts. 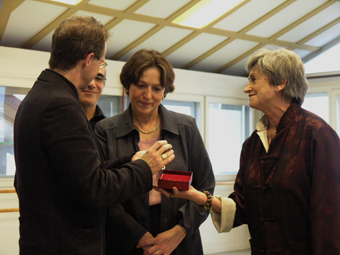 The Danish team was accompanied by Anne-Marie Sandrini, and by the art historian Richard Flahaut. All the Conservatoire’s teachers attended. The Conservatoire’s dancing-school children had been given leave from their regular day school to take the morning off, and, with their parents watching, danced for the Danes. The pianist, who takes part in the Conservatoires’ pilot scheme, that aims at developing a closer relation between the music and the dance, played an introduction by Carl Nielsen in greeting. 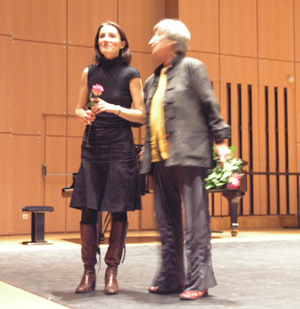 Anne-Marie Sandrini explained that the pilot scheme involves, inter alia, getting the ’musiciens-accompagnateurs’ actively involved in teaching the children, by for example, taking themselves out from behind the piano, into the room, and shewing the children directly rhythmical and other exercices. She also explained that although few of the students in the municipal Conservatories will make it their profession, her view is that when a child wishes to learn the classical dance, this represents a great opportunity to educate him as a Citizen, and elevate his soul. Presenting the Medal of the City of Paris "Danse et Musique"
and with a tear-sheet from an accounts book of 1809, that had been the property of Claude Bessy, bearing the names of the great dancers of the day, including Madame Pierre Gardel. 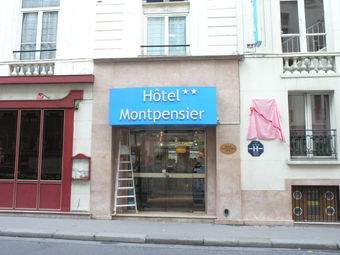 The team then repaired to Number 12, rue de Richelieu, the former Hôtel des Hautes Alpes, now Hôtel Montpensier, where Bournonville had stayed in 1838 and 1874. 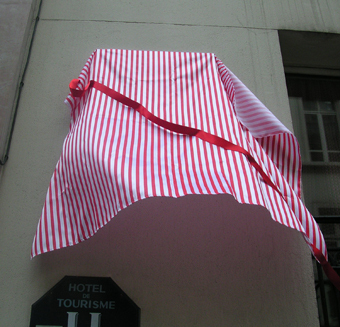 Hotel Montpensier, in Bournonville’s day "Hôtel des Hautes Alpes"
The team was greeted by M. Daniel Brodeur and M. Jean-Yves Bras, respectively manager and owner of the hotel, by the Mayor of the First Arrondissement, by Merete Soussan Cultural Attaché of the Danish Embassy, and by a crowd of about thirty people, including several reputed dancing teachers and figures from the art world. 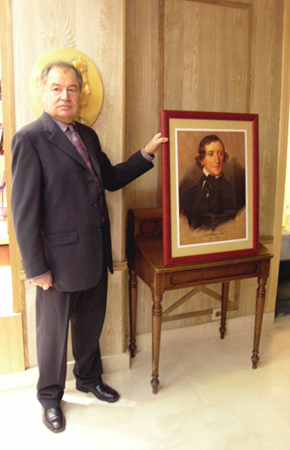 A history of the Hotel since 1648 was presented to the Danes by M. Bras, while the Danes in turn presented the hotel with a portrait of Bournonville, now in the hotel’s breakfast room. 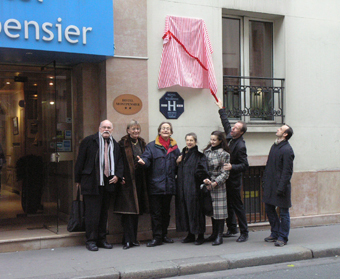 They then unveiled the plaque in Bournonville’s honour. 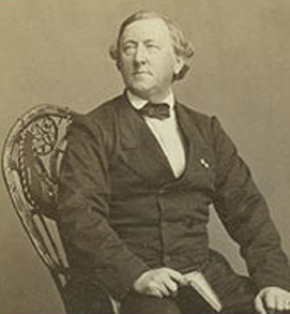 Richard Flahaut recalled - to our surprise - that Bournonville had actually stayed there again, in July 1874, visiting the building site for the Palais Garnier, then under construction. Amongst several theatrical performances, he saw the young Sarah Bernhardt at the Comédie Française two steps away, although he was not overly delighted with her diction and histrionics. 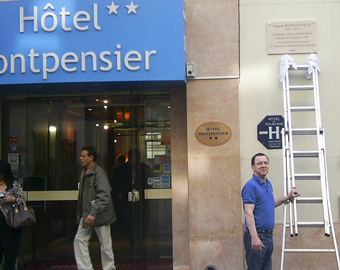 the team hied off to Nanterre, to teach the Paris Opera School’s First and Second Divisions. 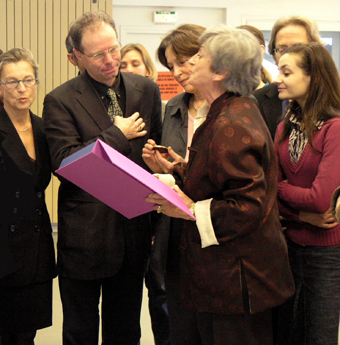 The team was greeted with great warmth by the étoile Elisabeth Platel, now the School’s Director. Mlle. Platel had invited all the School’s pupils, as well as the teaching staff, to attend. This private event was followed by a truly admirable performance of the Flower Festival by Thomas Lund and Diana Cuni, for the children of the Opera School. "When I have seen you shew those enchaînements, with a quality of such passion, I realised for the first time, what is the direct relation between the mime, and the dance. In the mime, the gesture must come from within oneself, and move to the outside world. But it should be no different in the dance! There must be true emotion attached to each movement and gesture, and we have forgotten that in our dancing. We bring a child to the dance by letting him play (le jeu), then we must allow him to learn what are the true emotions, by having him perform ballets like those of Bournonville, and only then, may he learn to dance the abstract ballets, and bring to them, the right quality of emotion. Also, the épaulement as you teach it, is an expressesion of a deep emotion. One of the reasons that we have problems with the transfer of weight, is that the épaulement, the transfer of weight, and the emotion, must all be coherent." With thanks to Nadejda Loujine, Romain Feist, Bénédicte Jarrasse and Simona Gouchan for their invaluable help with logistics. "UN HOMME POUR TOUTES FORMES D’ART THÉÂTRAL"
"Auguste Bournonville a une place à part dans l’histoire de l’Opéra Royal Suédois. Pas seulement à cause de son père, Antoine, qui a été premier danseur du Ballet Royal Suédois entre 1782-95, ni à cause de sa mère, Louise, ou de sa femme Helena Fredrika, qui étaient toutes les deux d’origine suédoise. Pas non plus parce qu’il a ouvert les portes de sa maison à Copenhague pour la soprane Jenny Lind pendant sa première marche triomphale à l’étranger ou parce que sa fille, Charlotte, a fait ses débuts de cantatrice à l’Opéra Royal de Stockholm. Il ne faut pas non plus oublier qu’Auguste a fait plusieurs apparitions comme danseur étoile à Stockholm pendant quelques dizaines d’années et que plusieurs étoiles de la danse suédoise ont été ses élèves. 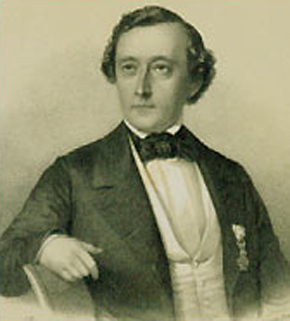 Auguste Bournonville a donné une dizaine d’oeuvres au Ballet Royal Suédois. De cette manière ses créations chorégraphiques ont coloré les traditions dramatiques du ballet dans un autre pays scandinave. Mais, avant tout, la scène nationale suédoise lui a donné la possibilité de développer tout son talent créatif pendant une période où son propre pays natal, le Danemark, apparemment ne s’intéressait pas beaucoup à ses créations, notamment pendant les années 1861-64. En tant que " premier metteur en scène et intendant " du Théâtre Royal, Auguste Bournonville a mis en scène pendant cette même période - période de rupture entre le romantisme et le réalisme - des opéras, des ballets et des pièces théâtrales avec une connaissance encyclopédique et une brillance artistique qui ont laissé de profondes traces dans l’histoire de l’art théâtral suédois. C’est pour tout cela que l’Opéra Royal Suédois et le Ballet Royal Suédois rendent hommage à Auguste Bournonville." "A MAN FOR THE THEATRICAL ART IN ALL ITS FORMS"
"The place enjoyed by Auguste Bournonville in the history of the Royal Swedish Opera is a special one. 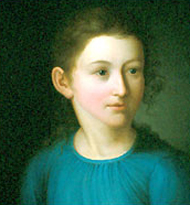 Not only on account of the fact that his father, Antoine, was premier danseur at the Royal Ballet of Sweden from 1782 to 1795, or that both his mother Louise as well as his wife Helena Fredrika were Swedish. Not only on account of his having welcomed the soprano Jenny Lind at his Copenhagen home, during her first, brilliantly successful, foreign tour, nor even because his daughter Charlotte made her début as an opera singer on the Royal Opera’s stage at Stockholm. "One should not forget that over several decades, Auguste appeared as danseur étoile at Stockholm, and that several leading lights of the Swedish ballet were his pupils. 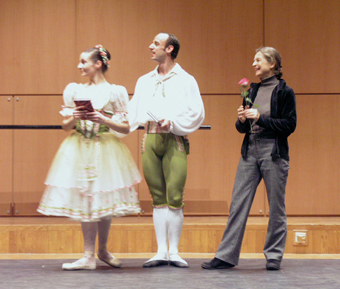 "Auguste Bournonville created about ten works for the Royal Ballet of Sweden. His choreographic creations have thus coloured the ballet’s dramatic heritage in a second Scandinavian nation. But above all, it was the Swedish national stage that afforded him the opportunity to develop his creative abilities between 1861 and 1864, at a particular point in time when his native land, Denmark, seemed to shew scant concern for his work. As the Royal Theatre’s " premier metteur en scène et intendant ", Auguste Bournonville put up on the Swedish stage, at the very moment of transition between Romanticism and Realism, operas, ballets and theatre plays, that, thanks to his encyclopaedic knowledge and artistic intelligence, have left a deep imprint on the Swedish theatre. "For all these reasons, the Royal Opera and Royal Ballet of Sweden, pay homage to Auguste Bournonville." 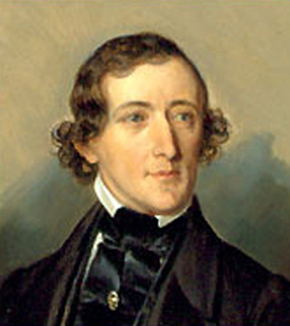 "On behalf of all British lovers of the choreography and teaching of August Bournonville, we salute the initiative of the Comité Bournonville in celebrating his bicentenary so appropriately in Paris. It was in your city that he learned so much from his great predecessor Auguste Vestris." 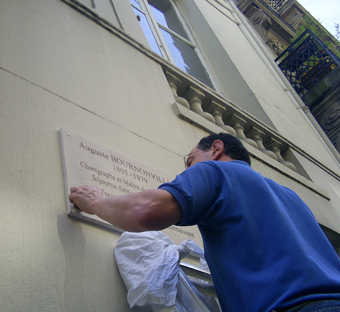 "De la part de tous ceux qui, en Grande Bretagne, estiment la chorégraphie et les enseignements d’Auguste Bournonville, nous saluons l’initiative prise par le Comité Bournonville afin de célébrer de manière aussi appropriée son bicentenaire, à Paris. Car c’est dans votre ville qu’il put autant apprendre auprès de son grand prédécesseur Auguste Vestris." 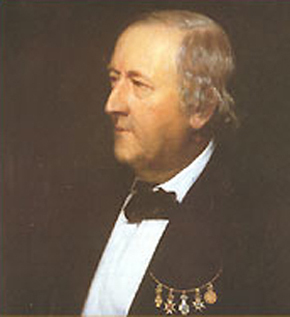 "I should have liked to attend the inauguration of the Bournonville Studio in the Conservatoire of the Seventh Arrondissement, but jury duty at Bonn prevents me. However, allow me to salute our colleagues from France and from Denmark on this occasion, because, more perhaps than to some of my fellow musicians, the dance has a special resonance for me. "When I perform on the piano, I see all manner of dancing forms and figures, colours, and even a kind of architecture. 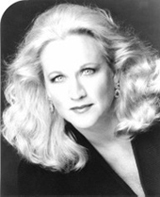 Twenty-eight years ago, I collaborated with Noella Pontois, who was at the time, étoile at the Paris Opera. Together, we did a piano/dance duo. The phrasing, if you think piano alone, will be percussive. Whereas, if you think of the hand as though it were drawing a bow across the strings, the hand itself will dance. If one is not merely playing upon the piano, but rather let the music come from within, there is a flow in the phrasing that is like the dance. Thus, I dance within myself, although I would never, ever actually dance! I have too much feeling inside myself, for the dance!" 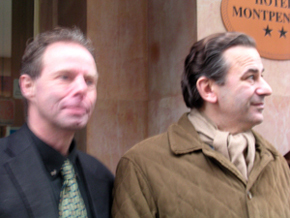 "J’aurais souhaité assister en personne à l’inauguration du Studio Bournonville dans le Conservatoire du VIIe mais mes obligations pour le Jury à Bonn m’en empêchent. Cependant, permettez-moi de saluer nos collègues de France et du Danemark en cette occasion car, peut être plus que pour certains de mes condisciples musiciens, la danse possède pour de moi une résonance particulière. Lorsque je joue au piano, je vois maintes formes et figures de danse, des couleurs, et même une sorte d’architecture. Il y a vingt-huit ans, j’ai collaboré avec Noëlla Pontois, à l’époque étoile de l’Opéra de Paris. Ensemble, nous avons créé un duo de piano et danse. Si l’on pense en termes du piano seul, le phrasé sera percutant. Alors que si l’on conçoit la main comme si elle faisait résonner l’archet sur les cordes, la main elle-même dansera. Si l’on dépasse le simple fait de jouer sur un piano, pour permettre que la musique vienne du for intérieur, alors le phrasé revêt le mouvement d’une danse. C’est ainsi que je danse dans mon for intérieur, quoi que jamais au grand jamais, je ne danserais dans la vie! J’ai, pour la danse, trop de sentiments!" Welcome and congratulations! 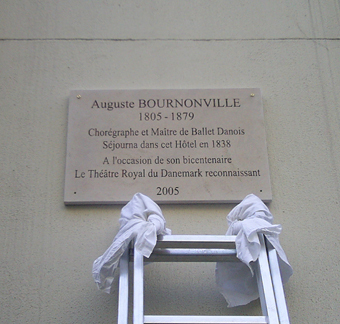 I am thrilled that August Bournonville is being honoured in this way. I, myself, am an opera singer, but my first love was dance. I believe that music and dance benefit greatly from each other and although it is certainly possible to sing without movement and to dance without music, the art forms are much better served when both elements are present. For me, they are inseparable. My few years of dance and movement classes have helped me immensely with my performances of opera, allowing me to express more fully the emotions and intentions of my characters. Unfortunately, I cannot be present, but send with this short message my best wishes for a successful conference." "Toutes mes félicitations! 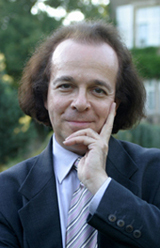 Je me réjouis de voir ainsi honorer Auguste Bournonville. Quoique cantatrice moi-même, mon premier amour fut la danse. 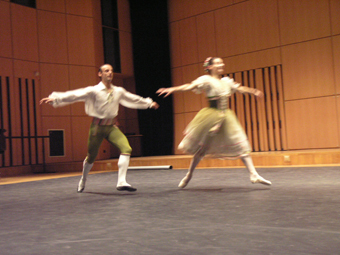 Je pense que la musique et la danse se nourrissent mutuellement, et même si l’on peut chanter sans mouvement et danser sans musique, les deux formes d’art sont bien mieux servies par la présence des deux éléments. Pour moi, ils sont inséparables. Les quelques années d’études de la danse et du mouvement que j’ai pu faire m’ont énormément aidé dans mes interprétations pour l’opéra, et m’ont permis d’exprimer avec plus de plénitude les émotions et les intentions des personnages que j’interprète. Je regrette de ne pouvoir être parmi vous, mais permettez-moi de vous transmettre mes salutations les plus sincères pour le succès de ces évènements. "